Installing an outdoor gas grill, fire pit, or fireplace? How about an outdoor kitchen? Our company’s philosophy is to assist the homeowner with their outdoor living spaces and landscaping in any way possible, which does not conflict with their landscape architect or design build contractor. With this in mind, our involvement with gas grills, fire pits, and outdoor fireplaces is needed. Our PECO certified gas and electric expert can help you obtain your goals. We offer plumbing and drain line service for your outdoor kitchen and living areas. Our company representatives can coordinate these infrastructure items that are so critical to the project success, with your landscape professional. To coincide with our landscape lighting background, Fisher Irrigation and Lighting is also proud to offer a wide variety of custom lamp posts to add beauty and security to your property. Lamp posts are also installed with a holiday outlet. 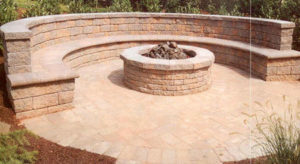 Recently one of the fire pits we assisted in was featured in Central Bucks Living Magazine.